OK, thanks Craig! Yeah, if you don't get the blue "reduced" message, then the picture should not double as a link. At this point, I don't know why some users get the "reduced" message and directly clickable picture, and others don't. Well, that test went down in flames. I can cross off pCloud from my list. It won't show the images directly in the post. You can technically click on the image holders to see the stamp pic in a new tab, but I want it to show in the post. Still looking for a decent cloud server replacement for Copy (the one I used to use) that will show the image directly in the post like most image hosts. Ugh, same problem. Can't get the image to show automatically in the post. The first enlarges the most, where the last two stay the same. But any one of the three is ok. But if "A" chose has to be made, I would go for the first one unless other options on the other new provider are better. I was pretty happy with the Copy cloud server I was using, but then they got out of the business. I'm still looking for a better alternative to Servimg, which is actually not bad (especially for free). The tests on page 1 of this thread were using the normal Servimg host, which is free and pretty good except that it doesn't do syncing, has a relatively restrictive filename/folder limitation, and has a 2Mo filesize limit. I can live with the last restriction. I'm trying to find an alternative image hosts that can overcome the first 2 limitations (preferable a general cloud server if possible, like the former Copy cloud server that I was using). So far, none of the cloud servers will let me show the image directly in the post. Copy cloud server used to let me do that, and it functioned quite similarly to Servimg when it came to posting images. I already tried Postimg. It's file handling capabilities are more limited than Servimg, so it's tough to find old images you uploaded. I do plan on giving Flikr a shot, especially since Yahoo took over and upped their free storage to a whopping 1TB. That certainly beats the free 25GB that I was getting previously at Copy. Filename/folder capabilities are top priority, but if they have syncing that's definitely a big plus. Thanks for reminding me about Flikr! By the way, this is the image I've been trying to test post using the cloud servers. The one below is posted using Servimg. 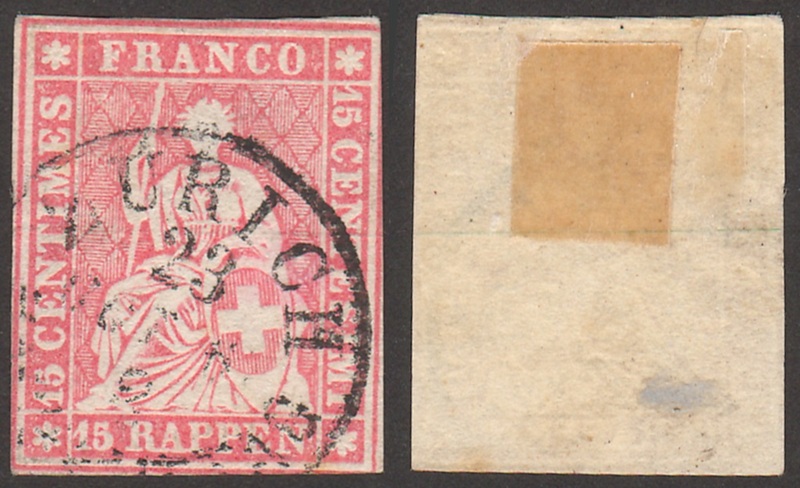 It is Scott Switzerland #22, front and back (showing emerald thread). I think I might use Flickr for the album pages instead of individual stamp images, as there does not appear to be a re-naming option nor sort nor sync available on Flickr. For me, for both of them, clicking produces nice expanded images in another tab. The two types behave identically.